How does the Zendesk Help Center Articles Duplicator work? This integration automatically duplicates Zendesk Help Center Articles from one main brand to multiple sub-brands. It also updates edited articles. This is a one way synchronization, so the main brand is leading. We sync every 30 minutes. This connector uses 1 main brand as course Help Center, the connector is a one way synchronization. Categories and Sections should be pre-defined in all sub-brands before installing this connector. We only sync articles with a label. Label mapping is defined in the connector. You need to install one connector per brand, so when you have multiple brands, repeat this installation. In order to connect your you need to create a Combidesk account first (create account here). Already using Combidesk? Great! Continue step 2. Visit the connector in the Combidesk app store here and click on the orange INSTALL button. Your now forwarded to the connect page. 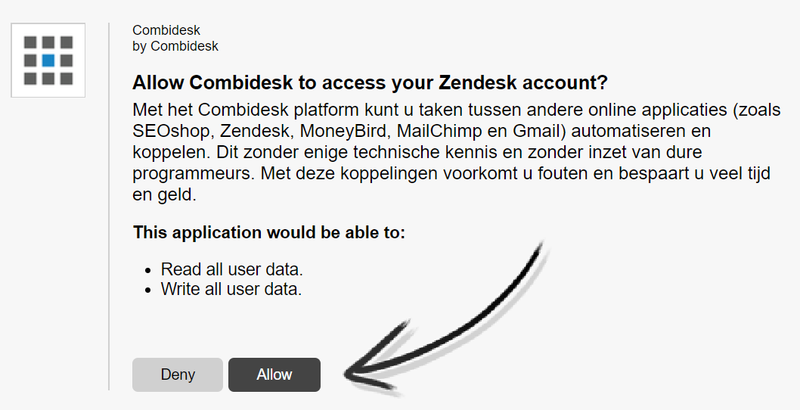 Click the orange button 'CONNECT YOUR ZENDESK ACCOUNT'. Enter your Zendesk Guide main URL here (NOTE: only the subdomain - we've prefilled .zendesk.com) and press ASK ZENDESK FOR PERMISSION. The connector only processes articles with specific labels. Fill in the label names here (comma separated). You may already have articles, do you want them to be synchronised too? Should drafts be copied too? This is the second time you need to connect to your Zendesk account. This time you need to connect to the Brand2 account (brand2.zendesk.com). Now you've successfully installed this integration. Do all Support Centers have the same Catergory and Section structure? Do you use the same labels as configured in this integration? You can use you Combidesk app to trigger changes faster than our common 30 minutes sync. Click 'Run' on the combi on your Combidesk dashboard. Do I need to pay for this integration? Yes, you can try this integration for 30 days. After the trial period this integration costs $10 per brand synchronization. So when you want to duplicate 3 brands you pay $30 per month.